We talked about sugary cereals last week, and reader Brian mentioned Kaboom. Wow, I really remember this cereal. I think it was one of the less-sugary sugary cereals out there, and it certainly didn't have the cool characters the others did--it had a kind of pathetic clown on the box. I loved it anyway. According to Wikipedia, "Quentin Tarantino's 2003 movie Kill Bill Vol. 1 included a scene in which character Vernita Green uses a gun hidden in a box of Kaboom cereal in an attempt to kill The Bride." Heh, I kind of remember that. But Kaboom cereal wasn't the only thing out there with that name. Kaboom was also a cool Activition video game for the Atari 2600. A little mad bomber guy in prison stripes dropped bombs on you and you used the paddle controller to try and catch them. There is an awesome and much-improved version of the game online here. Our charming but sad 2600 version had nothing on this. 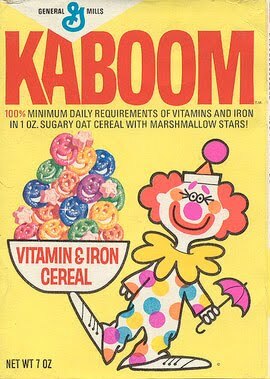 I loved KaBoom, but my favorite childhood cereal has to be Buc-Wheats! I found a link to the top 100 cereals in a quick google search...check it out. Lots of old favorites!